Thank you for visiting Grimo Nut Nursery. 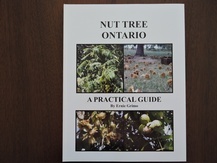 Ernie Grimo has been breeding and propagating nuts trees for over 45 years. We continue today to find the best and hardiest selections for our northern climate. We have introduced trees from North America, Europe and parts of Asia to test here. We test all of the cultivars in our 10 acre orchard to determine the best selections for our nursery production. In this way our customers are getting the best selections available. Important: We list our trees as ‘seedlings’, ‘grafts’ or ‘layers’ to identify how they were produced. Seedling trees are trees grown from seed. This means that they are the result of 2 parents and are not identical to either parent. Seedling trees obtained genes from both parents making each one a unique entity, sister trees in effect. No two have identical genes. 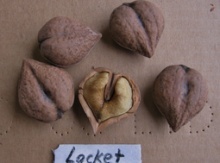 Some confusion arises when a seedling is identified by a cultivar name. This may be done to identify the mother tree or the parent source. Be prepared to ask if you are ordering a seedling or a clone when there is confusion. Trees that are produced by 'grafting', 'layering', 'cuttings' or 'tissue culturing' are clones of a superior selection or cultivar and have identical genes and in effect have most or all the characteristics of that cultivar. 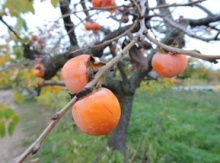 Each cultivar is given a name to identify it as a unque entity. Once we have identified a superior tree, we can clone it over and over again endlessly. Superior trees are given names to identify them. All the clones that are produced from them receive the same name too. We have named a number of our selected trees. Some nurseries use the names loosely by calling their seedling trees by the parent name. This can be misleading to the unaware buyer. We always indicate our stock as ‘seedling’, ‘layer’ or ‘graft’ as part of the name or source. 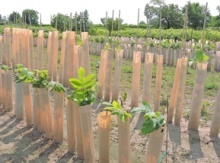 To find out more about trees produced by grafting and layering, go to our FAQ. We offer fresh nuts from our orchard and from other fresh sources too. 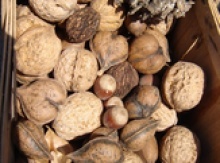 Try the incredible taste of fresh nuts from our offerings. Please refresh the website regularly. 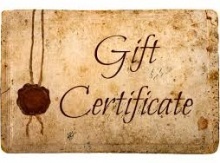 Our inventory is on the website and items cannot be ordered after the inventory is sold out. However, check the website for newly added stock in early April when stock is dug, where more trees are available than was originally inventoried. Spring shipping is completed for bare root trees by mid -May. Our catalogue will open for advance orders in the summer for shipping the following spring. 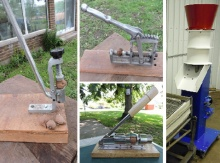 You can still order books, crackers and tools year round. Our bare root trees can be shipped right to your door or picked up at the nursery at the right time for planting in April. Please choose from the 'Nut Tree' and 'Fruiting Tree' selections, (not Potted trees). We do not fall ship. All of our nursery trees are spring dug to provide you with the freshest possible trees. They are pre-sold through orders taken all year on a first-to-order basis. 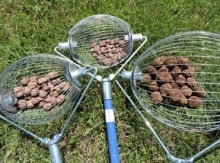 Our aim is to provide you with the best tasting, easiest cracking, most hardy nut trees available. We are pleased to provide a plethora of information on this new website to help you select the most suitable trees for your planting site. Please do not order potted trees through the website. 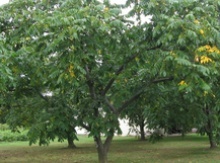 They are listed only to provide a general selection of trees and are not kept up to date for specific cultivars. Ignore the 'sold out' indicator beside the item. Potted trees are available from mid-June to mid-October. 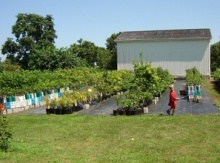 These trees are for guests who visit the farm to pick them up as we do not ship potted trees. The selection varies from year to year and is subject to availability. Contact us to find out if what you want is available since the selection is limited.We are open from 10-5 daily 12-5 on Sundays at 979 Lakeshore Rd, Niagara-on-the-Lake, ON. Prices are higher than our online bareroot trees to compensate for the costs associated with potting trees and keeping them on the irrigation system for up to 2 years.